In 1994, we produced Mercury free LR6 and LR03 alkaline batteries, and in 2001 we introduced LR20 and LR14 mercury free alkaline battery production lines, on purpose of completing the alkaline battery series. Till now, our company becomes main alkaline battery production base in China. Our alkaline battery products include LR20, LR14, LR6, LR03, 6LR61, LR1, LR61, 4LR61 alkaline batteries in blister-pack and shrink-pack, NO Mercury, NO Cadmium, NO Lead Added. Specifications︰ For use in applications requiring heavy currents for long periods of time. 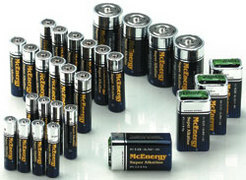 Alkaline batteries can deliver 50-100% more total energy than conventional Carbon Zinc batteries of the same size. Non-rechargeable! Advantages︰ Special Formula to meet the demands of today's new generation of high power deveics. Durable shelf life than Zinc Chloride battery.